It was a chance remark he made back in the late ‘90s that got Andy started on what has become a labour of love spanning two decades. 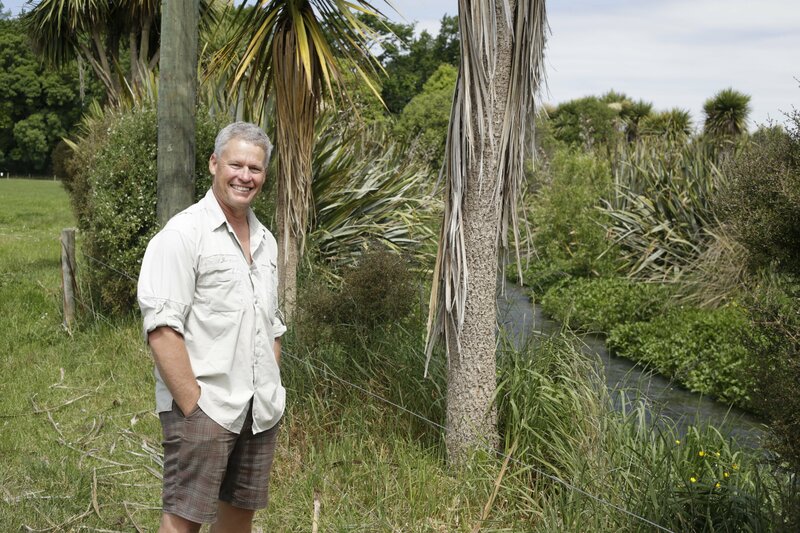 And it’s a passion that’s resulted in an extraordinary legacy of lush riparian planting of native species on his farm near Temuka, which he owns with wife Sharon Collett. Along the way there’ve been plenty of blisters, blunted spades and water-logged gumboots – and plenty of visitors to admire the work and learn from it. For Andy and Sharon personally, the net result today is water that’s gin-clear in the arm of the Ohapi Creek meandering past their house and through their land. With that water quality come trout and salmon, visually pleasing plantings and prolific birdlife. It all started when the couple took out the traditionally styled garden around their home, replanting it with native species Andy had enjoyed seeing on his frequent tramping trips in the bush. One day, when Andy mentioned he’d like to extend the native garden along the creek, their landscape designer immediately saw he needed help – and knew where he’d get it. She told him to call Environment Canterbury (ECan), which was at that stage keen to get some riparian pilot projects underway in the South Canterbury region. ECan wanted work that could be showcased to inform and inspire other farmers in the years to come. Along with hands-on support, ECan connected Andy to sources of funding to help with transforming the creek which, like a number of waterways around the country, had taken a toll during the farming of the land – sheep, cows and pigs, as well as cropping including grass seed, wheat, barley, potatoes, carrots and onions. 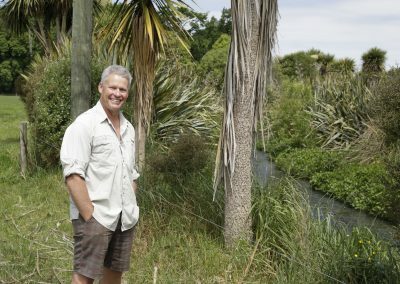 Fast-forward to today and Andy enjoys the flourishing riparian planting that now stretches along about three kilometres of the creek, and which he adds to every year – either to extend it or grow plants in areas where vegetation is a bit sparse. As with most farmers, Andy didn’t pay much attention to documenting his work over the years – he just rolled up his sleeves and got on with it. And so he welcomes the recently launched initiative to create, for the first time, a national database of all established riparian buffer zones around the country. 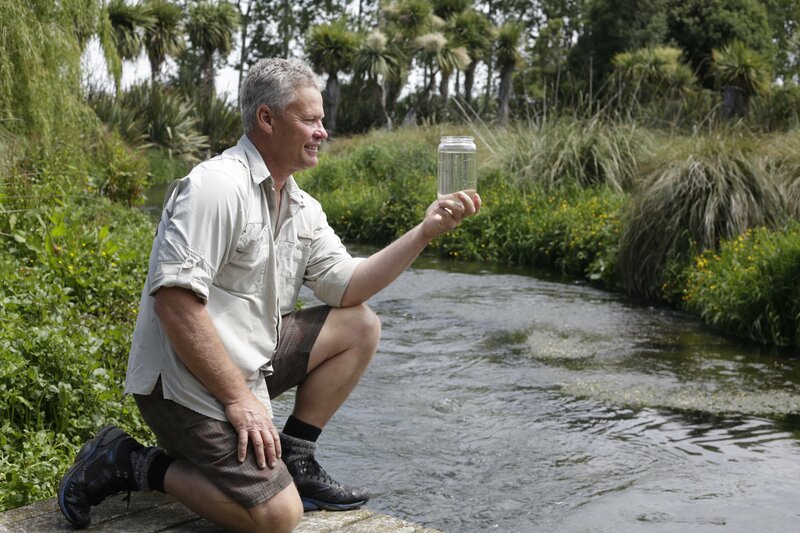 The information logged will also assist water quality scientists at DairyNZ and NIWA to improve understanding of how riparian buffers benefit waterways, and why some work better than others. He recommends identifying areas to plant out and developing a plan to progressively plant, beginning with clearing the likes of willow clogging waterways – he took the digger to his – and then spraying invasive species such as blackberry, gorse and broom. Using a residual spray that will last 12 months, Andy then sprays a circle where he will place each plant. Andy’s farm uses irrigation, and he runs the lines right up near the creek so young plants can be watered if necessary. In his early riparian days, Andy lost some plants to frosts, and now he selects more hardy species like carex, toetoe, flax and cabbage trees for the first stage, avoiding the broadleaves that don’t survive a freeze. Other native species he favours include pittosporum, ribbonwood, coprosmas such as mingimingi, and gossamer grass. An unforeseen fringe benefit of Andy’s riparian commitment has been the appreciation of his sharemilkers over the years. Currently, Eugene and Sarah Cronin are 50:50 sharemilkers on the property, overseeing 146ha (effective) and 540 cows. They’re in their second season there. 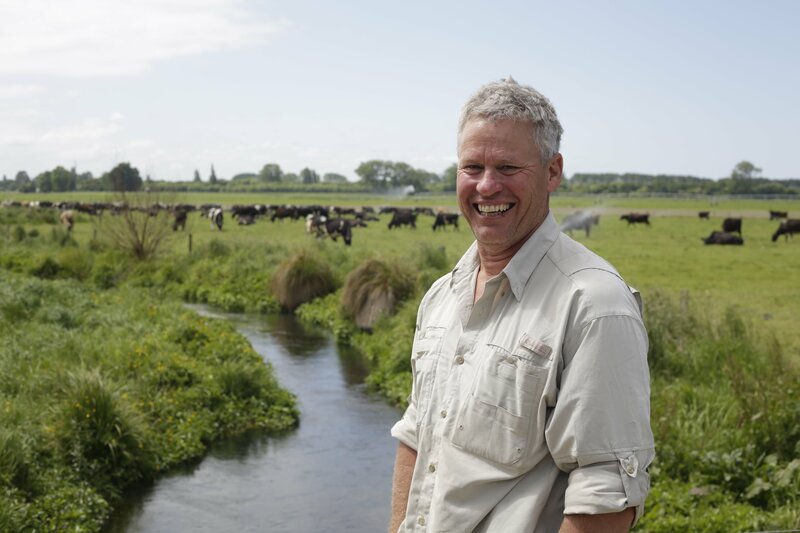 “Two of our previous sharemilkers have gone on to own their own farms, and both are doing riparian zones,” says Andy. They are Aaron and Frances Coles, and Karen and Kevin O’Kane, who both farm a short distance away. 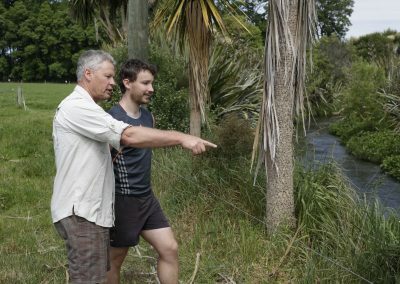 The Coles’ farm is at the source of the Ohapi and, while fencing was already in place, Aaron and Frances were keen to get planting to further improve the water quality and biodiversity. “It’s about improving the land for future generations – we want to leave it in a better state than we received it,” says Frances. 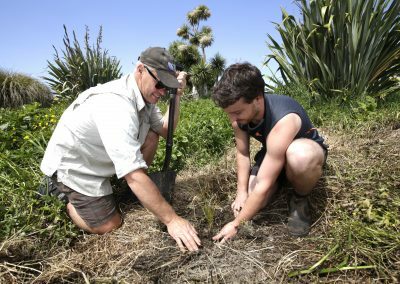 The Coles received support from ECan for the plants – nearly 4000 have been planted in the first phase of the project, and they’re flourishing. As a number of farmers and garden owners in the region have done, they sought the local knowledge and expertise of contractor Chris Goad, who also just happens to be married to one of their staff members. Likewise, after their experience of riparian planting with Andy, the O’Kanes were quick to line up planting spades when they bought their farm in 2014.
already fenced it and dealt with the willows. ECan provided the plants. Now the couple is progressively planting other areas of their farm “as we have the time and the funds”, says Karen. 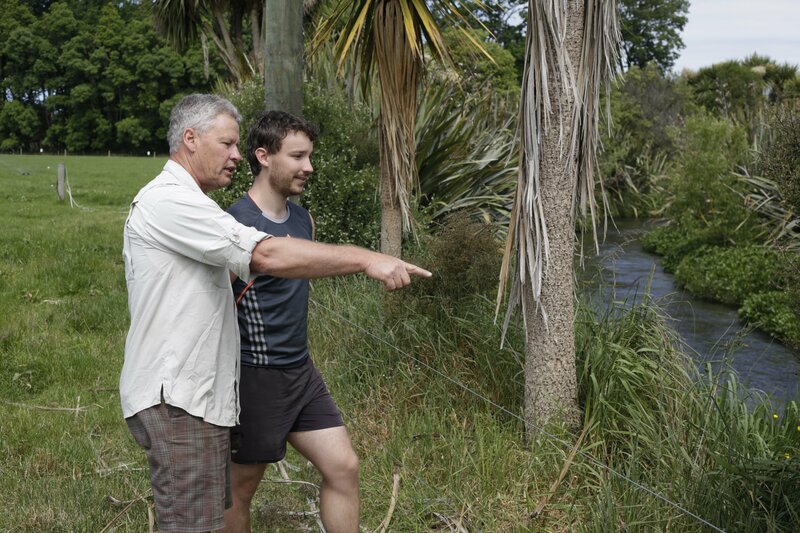 If you’ve been inspired by these farmers and would like help creating a riparian management plan for your farm, go to dairynz.co.nz/riparian-planner today.